While working on the Ramphastidae Family yesterday, I decided to share some of the beauty the Lord created in this group of birds. 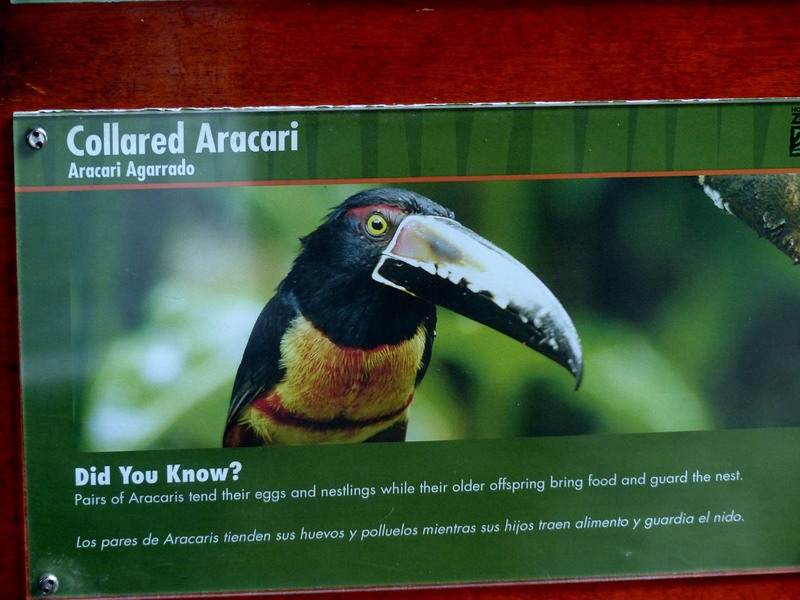 These are the Toucans, Toucanets, and Aracaris. They are just so appealing to see and wonder how the Lord comes up with so many designs and colors in His Creation. This family definitely show such variety. This morning while reading my latest Acts & Facts, there was an article about Diversity by Dr. James J. S. Johnson, who did our guest article this week,( Bird Brains, Amazing Evidence of God’s Genius). Both are very interesting articles worth reading. But I want to quote Dr. Johnson about variety. Two words summarize the answer: life and variety. Even in this after-Eden world, cursed and groaning as it is under the weight of sin and death, we still see a prolific and diversified creation. Why did God design earth’s biodiversity the way that He did? This family catches your eye and causes a second look. 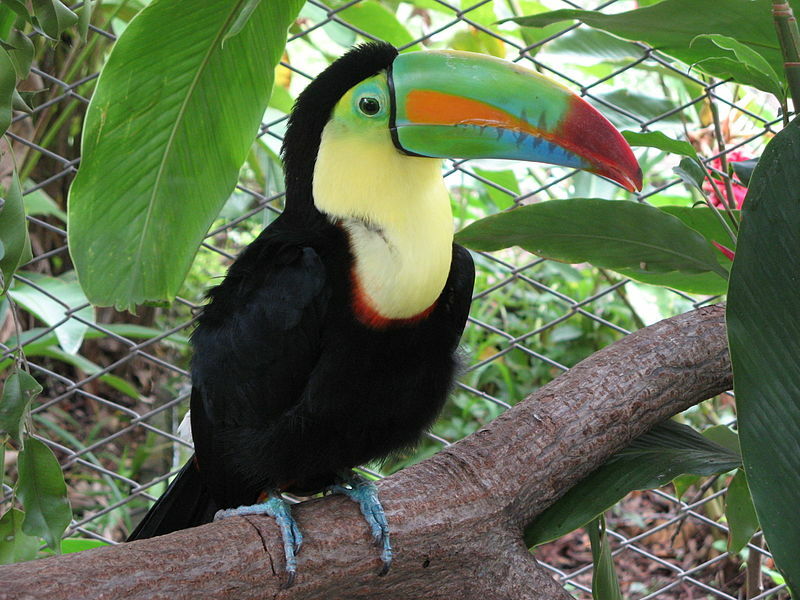 Toco Toucans are familiar to many, and some of the others. (Even Toucan Sam is the cartoon mascot for Froot Loops breakfast cereal). 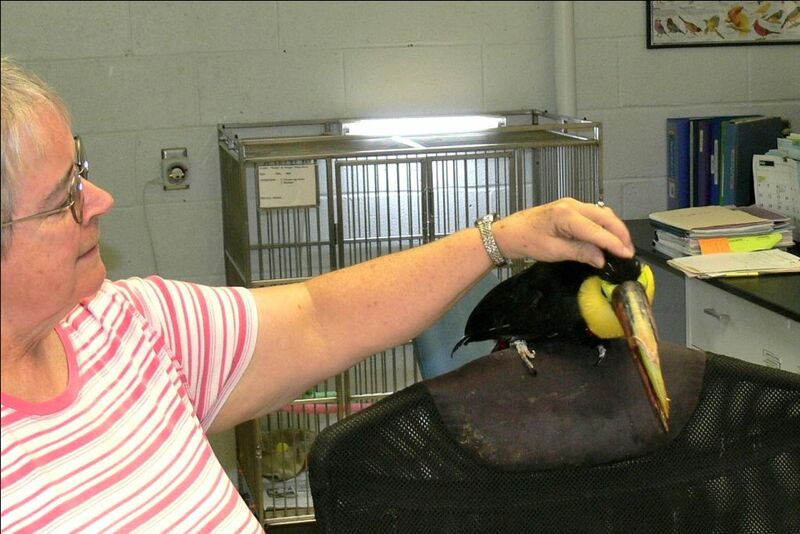 We had the privilege to meet “Gracie” a retired Chestnut-mandibled Toucan at the National Aviary. 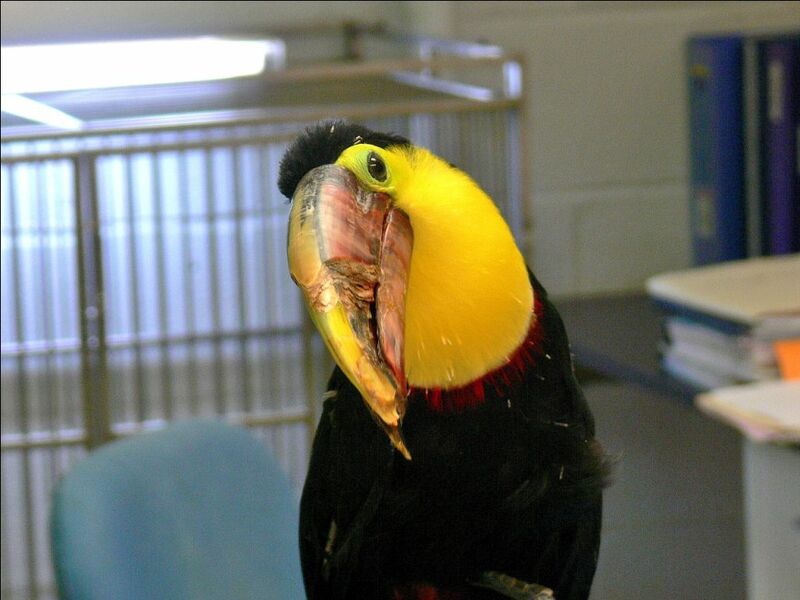 (National Aviary – Hospital, Breeding, and Kitchen Areas) Needless to say, that is the closest I have been to a Toucan. 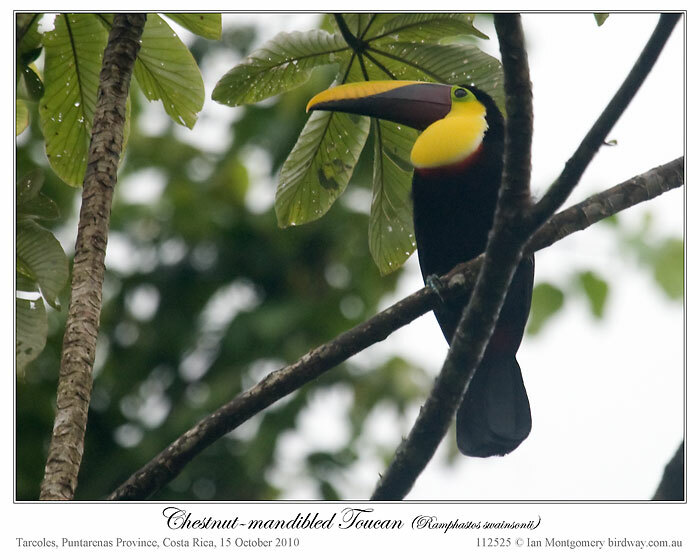 The Ramphastidae Family has 5 or 6 genera, depending on sources, with Toucanets in the Aulacorhynchus and Selenidera, Mountain Toucans in the Andigena genus, Aracaris are Pteroglossus with the Saffron Toucanet added by some, and the Typical Toucans belong to the Ramphastos genus. 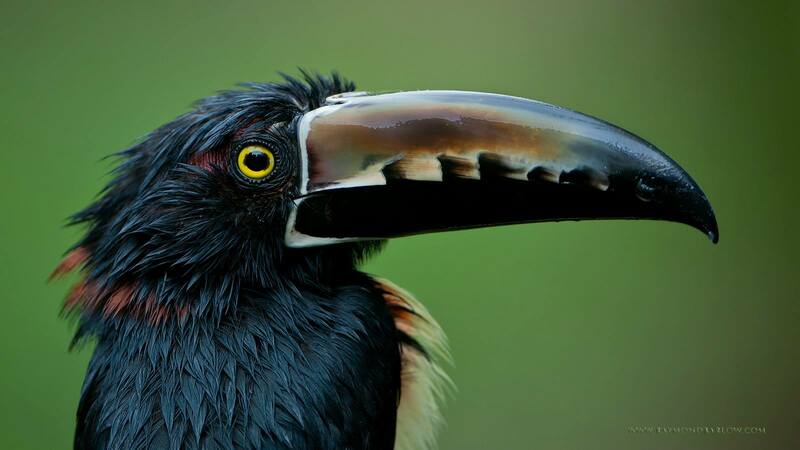 The “Toucan” name of this bird group is derived from the Tupi word tukana, via Portuguese. They have large colorful and brightly marked bills. Toucans range in size from the Lettered Aracari (Pteroglossus inscriptus), at 130 g (4.6 oz) and 29 cm (11.5 inches), to the Toco Toucan(Ramphastos toco), at 1.5 lb (680 g) and 29 inches (63 cm). Their bodies are short (of comparable size to a crow’s) and compact. The tail is rounded and varies in length, from half the length to the whole length of the body. The neck is short and thick. The wings are small, as they are forest-dwelling birds who only need to travel short distances. The legs of the toucan are strong and rather short. Their toes are arranged in pairs with the first and fourth toes turned backward. The majority of toucans do not show any sexual dimorphism in their coloration. However, the bills of female toucans are usually shorter, deeper and sometimes straighter, giving more of a “blocky” impression compared to male bills. The feathers in the genus containing the largest toucans are generally black, with touches of white, yellow, and scarlet. 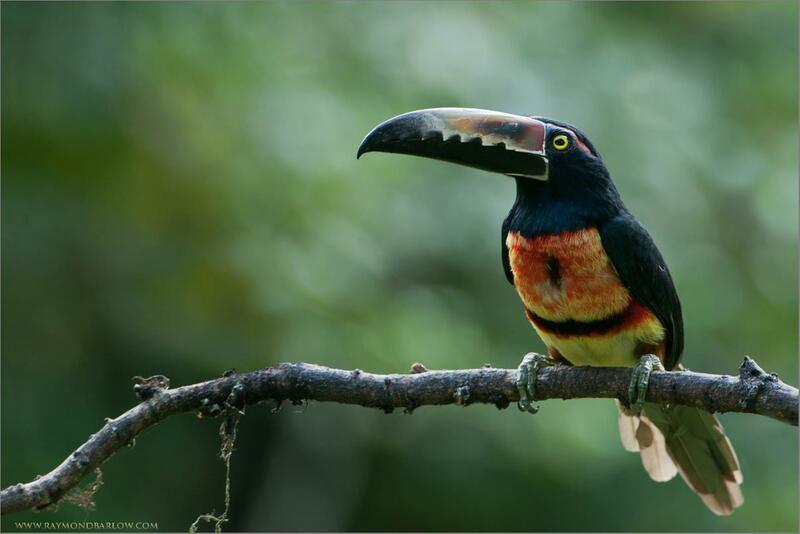 The underparts of the araçaris (smaller toucans) are yellow, crossed by one or more black or red bands. The toucanets have mostly green plumage with blue markings. 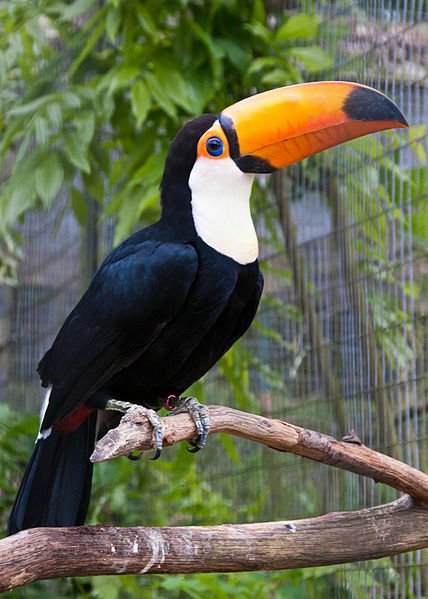 Toucans are native to Southern Mexico, Central and South America, and the Caribbean region. They generally live in tropical and sub-tropical regions. 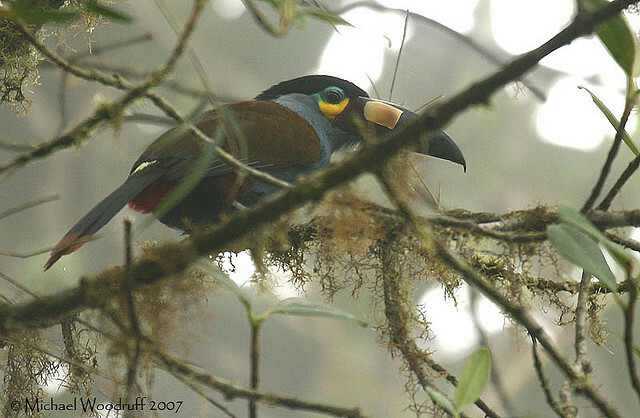 They make their nests in tree hollows and holes excavated by other animals such as woodpeckers—the toucan bill has very limited use as an excavation tool. They mainly eat fruit, but will eat insects and small lizards if they become available. 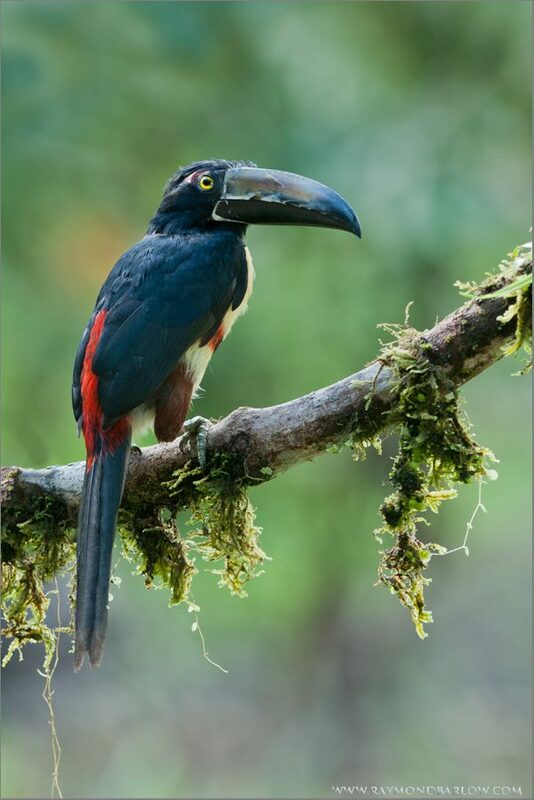 However, in their range, toucans are the dominant frugivores, and as such play an extremely important ecological role as vectors for seed dispersal of fruiting trees. 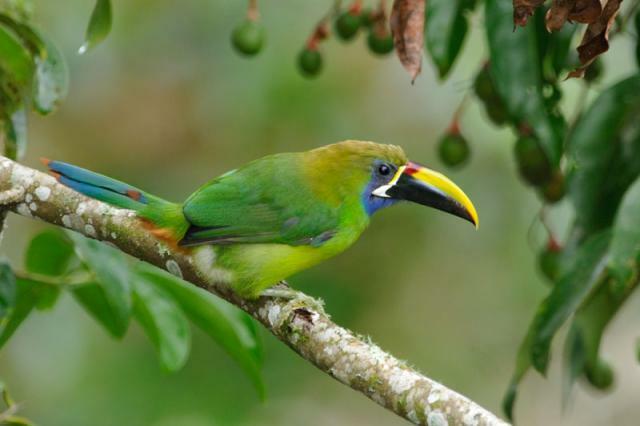 The green toucanets are birds from the genus Aulacorhynchus in the toucan family. They are native to Mexico, and Central and South America. All are found in humid forests and woodlands in highlands, but a few also occur in adjacent lowlands. They are relatively small toucans, 12–17 in (30–44 centimetres) long, with colorful, mainly green, plumage. They are typically seen in pairs or small groups, and sometimes follow mixed species flocks. Selenidera is a bird genus containing six species of dichromatic toucanets in the toucan family Ramphastidae. They are found in lowland rainforest (below 1,500 metres or 4,900 feet) in tropical South America with one species in Central America. 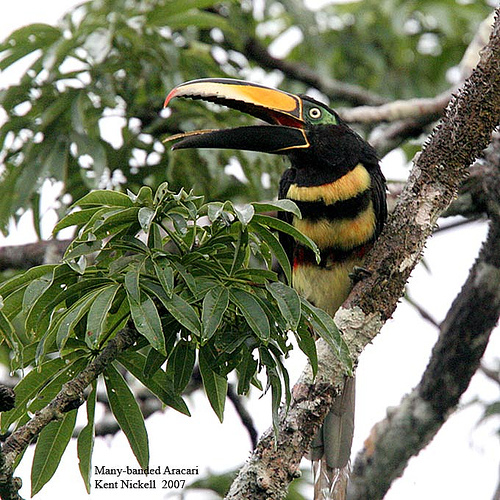 An aracari or araçari is any of the medium-sized toucans that, together with the Saffron Toucanet, make up the genus Pteroglossus. They are brightly plumaged and have enormous, contrastingly patterned bills. 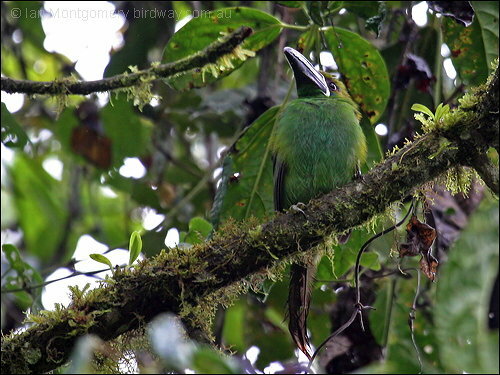 These birds are residents in forests and woodlands in the Neotropics. 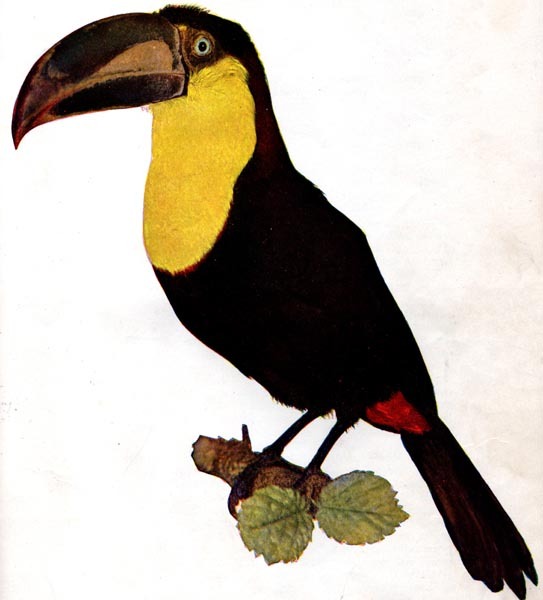 Andigena, the mountain toucans, is a genus of birds in the Ramphastidae family. They are found in humid highland forests in the Andes of South America, ranging from Bolivia to Venezuela. These medium-sized toucans all have olive-brown upperparts, a black crown, yellow rump, blue-grey underparts and a red vent. Ramphastos is a genus of toucans, tropical and subtropical near passerine birds from Mexico, and Central and South America, which are brightly marked and have enormous, often colourful, bills. This genus comprises the largest toucans, ranging from 17 to 24 in (42 to 61 centimetres) in length. All have black wings, tails and thighs, but the color of the remaining plumage depends on the exact species involved. All the species are basically fruit-eating, but will take insects and other small prey. They are arboreal and nest in tree holes laying 2–4 white eggs. They are essentially resident birds, but may take part in minor, local movements (e.g., to lower altitudes in the winter). Enjoy the variety of these beautiful birds that have been placed here for their benefit and our enjoyment by their Creator. Clicking the links will reveal some that are at various websites besides the ones here. I think everybody, birders and non-birders, likes Toucans. 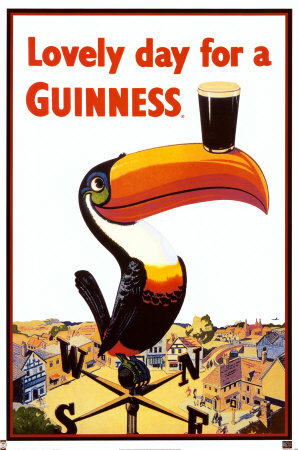 They’re one of the iconic, almost cartoonish, animals that were introduced to as young children and I remember Toucans (and Gnus) featuring in posters for Guinness stout in Ireland in the 1950s. Their unbelievably large and colourful bills are so outlandish that it is a delightful shock to come across them in the flesh, particularly in the wild. The Villa Lapas hotel where I stayed in the Pacific lowlands of Costa Rica had a rainforest canopy trail in its grounds and I checked it out one thundery and gloomy afternoon. The rain held off for most of the trek but, for the most part, the birds didn’t like the weather any more than I did and the light and the dense foliage made it hard to see much less photograph anything. However, repeated raucous calls led me to a pair of Chestnut-mandibled Toucans perched high in an unusually open tree. They proved to be very shy, fell silent as soon as I appeared and flew off into the forest giving me time to take only a few photos. 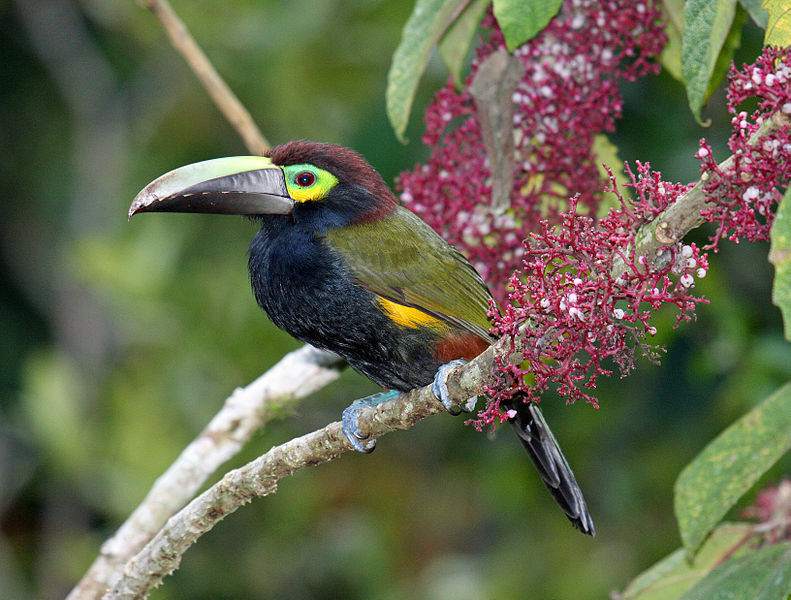 With a length to 61cm/24in, the Chestnut-mandibled is the largest Toucan in Costa Rica. Its range includes most of Central America and Northern South America from Honduras to Ecuador. Toucans use their large bills to collect fruit, but will also feed on nestlings. The structure of the bill is a honeycomb, so it quite light and not particularly strong. Its function has attracted a lot of speculation from reaching fruit, signalling and defence and the latest theory is that it is used as heat exchanger for cooling. The colours vary widely from species to species, supporting its use for species identification but they don’t vary either between the sexes or seasonally. 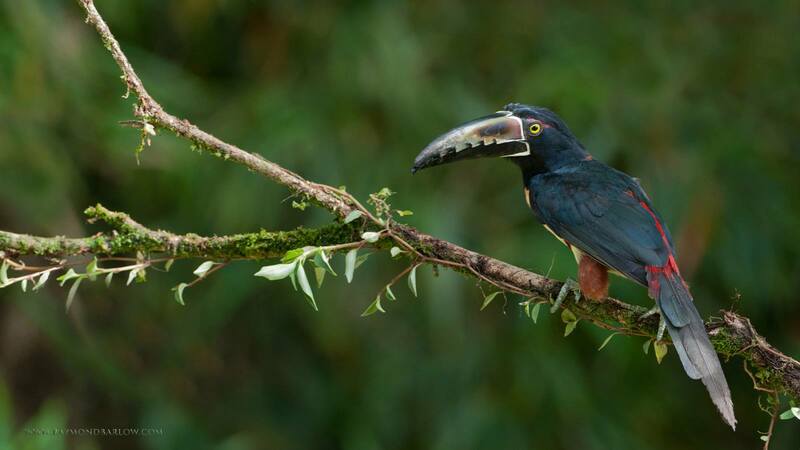 There are about a dozen species of large toucan (genus Ramphastos) and the toucan family (Ramphastidae) includes smaller ones such as Mountain-Toucans (Andigena), Toucanets (Selenidera) and Araçaris (Peteroglossus). All of these are restricted to Central and South America but the related Barbets occur also in Africa and Eurasia. If you are interested in examples of these, have a look at: http://www.birdway.com.au/ramphastidae/index.htm. Wow! What a milestone. Way to go Ian. 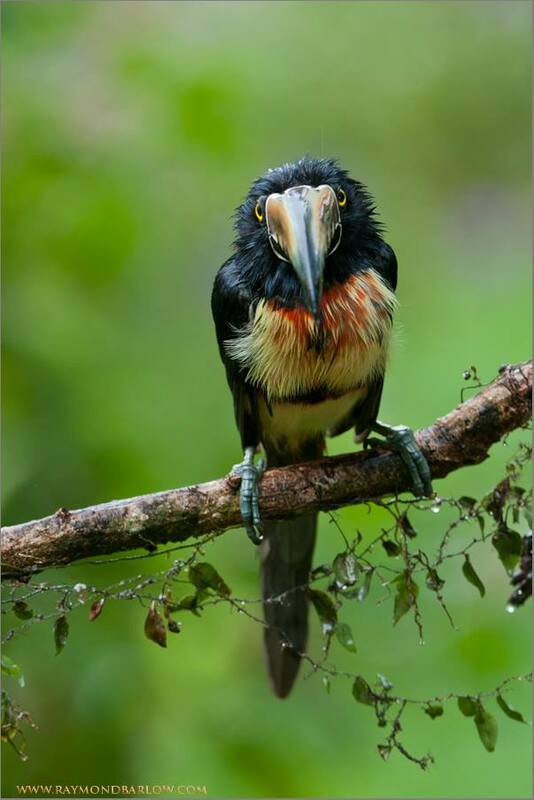 Hope he doesn’t mind, but I inserted one of his photos of a toucanet. Check out Ian’s link above of the Ramphastidae Family. We were able to meet and pet “Gracie” at the National Aviary in Pittsburgh, PA this summer. She is also a Chestnut-mandibled Toucan. Her beak as you can see is showing her age. She is retired now and is well cared for. Like Ian said, “I think everybody, birders and non-birders, likes Toucans.” I definitely think they are very neat. The Toucans, as Ian said, are found in the Ramphastidae Family. At present, there are 47 species in the family. They are part of the Piciformes Order which contains the Woodpeckers and their allies.